Some of you may have heard that the Center for Biological Diversity has petitioned the Third Court of Appeal in California to modify the Court's recent opinion. Rinehart is a suction dredger who was cited for dredging without a permit and he won his appeal. At the trial court level, Rinehart was not allowed by the judge to present evidence of federal preemption. In other words, where state and federal mining law conflict, federal law prevails and gives Rinehart the right to mine his federal mining claim. 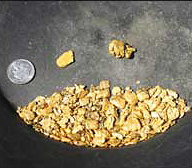 In this case, a suction gold dredge is the only economical method Rinehart could employ to mine his claim. Rinehart was denied this right because the State of California is refusing to allow suction gold dredge mining without a permit and refusing to issue permits for suction gold dredging. The Third Court of Appeal ruled Rinehart must be allowed to present evidence of federal preemption and referred the case back to the lower court. The Center for Biological Diversity petitioned the Third Court of Appeal on October 17, requesting they modify their opinion. The CBD claims the river in question is a navigable waterway; navigable waters belong to the state and not the federal government; therefore preemption should not apply. The CBD claimed this point "has not yet been briefed or argued before..."
Rinehart's attorney, James Buchal, filed his response to the CBD petition on October 21, stating this is "utterly false" and their position is "frivilous." In fact, this point was argued in court and the prosecution elected not to pursue this argument once the trial began. Buchal also points out the "river" in question is acutally a "tiny stream" that is "clogged with enormous boulders and could not remotely be termed navigable." The bottom line is the State of California cannot go back to trial on a matter that they already had the opportunity to argue, and the United States cannot be forced into being a party in this case.